Analytical Question: Which is the most powerful Mexican drug cartel? Recently, prosecutors in Mexico announced the discovery of 19 plastic bags containing human remains in the western state of Jalisco, an area already embroiled in cartel violence due to the dominant presence of the Jalisco New Generation Cartel (CJNG). This development indicates a probable continuation of the surging levels of violence that has gripped Mexico for more than a decade. In 2006, Mexican president Felipe Calderón deployed the military into the streets to combat rising cartel violence and militarization. Calderón’s strategy called for the removal of kingpins and prominent leaders within the cartels, after which the country witnessed increased cartel balkanization due to the ensuing power struggle (Lee et al. 2019). Fractures within prominent cartels and the resulting wars between splinter groups led to a significant increase in levels of violence all across Mexico. One such fracture was responsible for the genesis of CJNG, which split from the Milenio cartel. Notably, the Milenio cartel was operating at the time as a faction of the even larger Sinaloa cartel. Despite its initial alliance with the Sinaloa, CJNG eventually became large enough to not only stand on its own, but to rival the Sinaloa in terms of operational capability and territorial control. This further-contributed to the epidemic levels of violence in Mexico (Beittel 2019) that new president Andrés Manuel López Obrador has sworn to combat. López Obrador’s renewed strategy seeks to develop a National Guard or professional police force that will promote public safety, a proposal that has drawn criticism from some observers who note similarities to the failures of previous administrations (Agren 2018). Last week, Reuters reported that Mexican prosecutors were in the process of investigating human remains that were discovered inside 19 plastic bags (Anon. 2019). The source states the bags were found in a wastewater river on Wednesday, March 13, 2019, in Ixtlahuacan de los Membrillos, a municipality approximately 25 miles south of the Jalisco state capital, Guadalajara. The source failed to report how long the bags were suspected to have been there, but the Jalisco Attorney General’s office reported that forensic experts are currently establishing whether or not the bags contained complete bodies, and whether the victims had previously been reported missing. This most recent discovery is only the latest example of the escalating violence and brutality that has gripped Mexico since 2006. Totals vary slightly between sources, but it is estimated that Mexico saw 31,174 homicides in 2017, followed by a record 33,341 homicides in 2018, many of which are cartel related (Anon. 2018). CJNG has played a significant role in this increase since its inception, as the state of Jalisco has been ravaged by the cartel in recent years. One illustrative incident occurred after CJNG members mistook three Mexican film students for rival cartel members, resulting in their kidnapping, torture, execution, and bodies being dissolved in acid (Anon. 2018). This was followed by six Mexican police officers being shot dead in Jalisco on the first weekday of current President López Obrador’s administration (Anon. 2018). The publicly available information regarding cartel violence signals another epidemic-level year for violence in Mexico, and an ongoing challenge for López Obrador and his administration’s new strategy to combat cartel violence. Despite López Obrador’s promises and initial legislative moves to decrease the violence, it has continued unabated through the first months of his term (Valle-Jones 2019). Given this development, it can be stated with a high degree of confidence that epidemic levels of violence, primarily caused by Mexico’s drug cartels, will continue in the near term. This level of confidence and conclusion are supported by continuous reports of the ongoing violence in various regions throughout Mexico. However, it will take time before it can be determined if President López Obrador’s new strategy can effectively stem the violence occurring in Mexico, as it cannot be fully and fairly assessed at this point in time. Agren, D. (2018) “Mexican president-elect’s new plan to fight crime looks like the old plan”, The Guardian, 21 November, accessed on 19 March 2019. Anonymous (2018) “Mexican students were killed, dissolved in acid, officials say”, Reuters, 23 April, accessed on 19 March 2019. Anonymous (2018) “Six police killed in Mexican state ravaged by gang violence”, Reuters, 3 December, accessed on 19 March 2019. Anonymous (2019) “Murders in Mexico rise by a third in 2018 to new record”, Reuters, 21 January, accessed on 19 March 2019. Anonymous (2019) “Nineteen bags containing human remains found in Mexico”, Reuters, 15 March, accessed on 17 March 2019. Beittel, J.S. (2018) Mexico: Organized Crime and Drug Trafficking Organizations, Congressional Research Service, Washington, DC, United States. 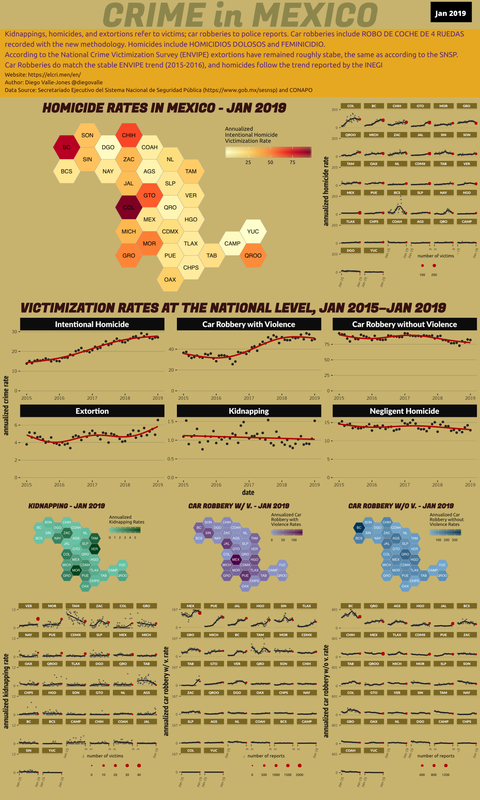 Valle-Jones, D. (2019) “Intentional Homicides – National” Mexico Crime Report, N.D., accessed on 19 March 2019. Tags: Ryan Lawrence. Bookmark the permalink.